The Old Stone House is a 1933 reconstruction of a 1699 Dutch farmhouse that was at the same location, in Park Slope near the Gowanus Canal. (The property was the site of fierce fighting during the 1776 Battle of Brooklyn.) The hearth itself was built by Boy Scouts just a few years ago. 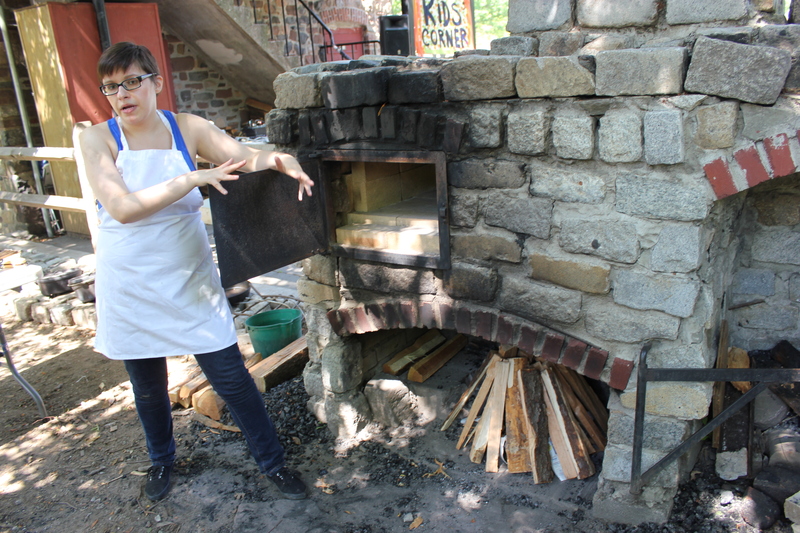 It included a bake oven — shown by Sarah in the photo below — though we did all our cooking on coals pulled out in front of the fireplace. On the menu for our class: soup meagre, an 18th-century dish made from spring vegetables; yeast rolls called rusks; moose filet (and no, you can’t buy that in New York City; Sarah got some from friends); and strawberry jam pie. But first we had to forage in the park for kindling and get the fire going. Sarah’s fire-building technique involved rolling several bundles of the kindling in newspaper and propping them up tepee style, then setting the wood up around them the same way (see above). I cooked the moose until the bacon was dark and crispy, then flipped it over to cook on the other side. I found the biggest challenge was not the heat from the fire but the smoke, which kept changing direction and burning my eyes. At least I didn’t have the problem that 18th century women did of trying to keep a long dress from catching fire — this was unfortunately quite common. Meanwhile, another student tended the soup meagre (from the French soupe-maigre). 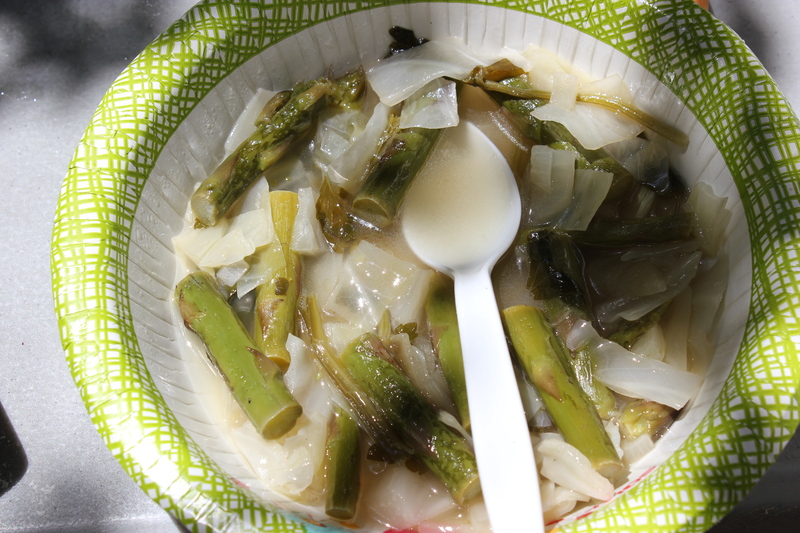 After sauteing onions in butter, he added chopped vegetables (asparagus, spinach, cabbage, and parsley) and water. The soup bubbled away in a cast-iron pot over another pile of coals (see photo at top). 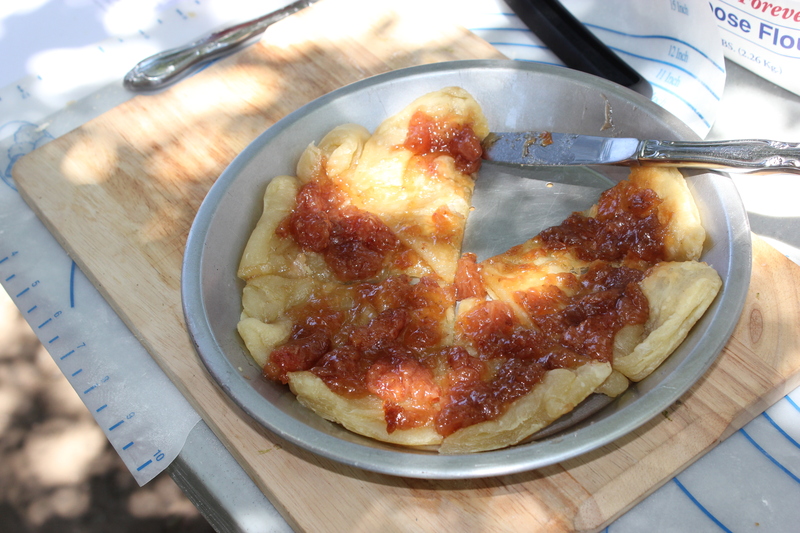 My friend Ellen put together the pie, using wonderful strawberry jam made by our instructor’s mother. 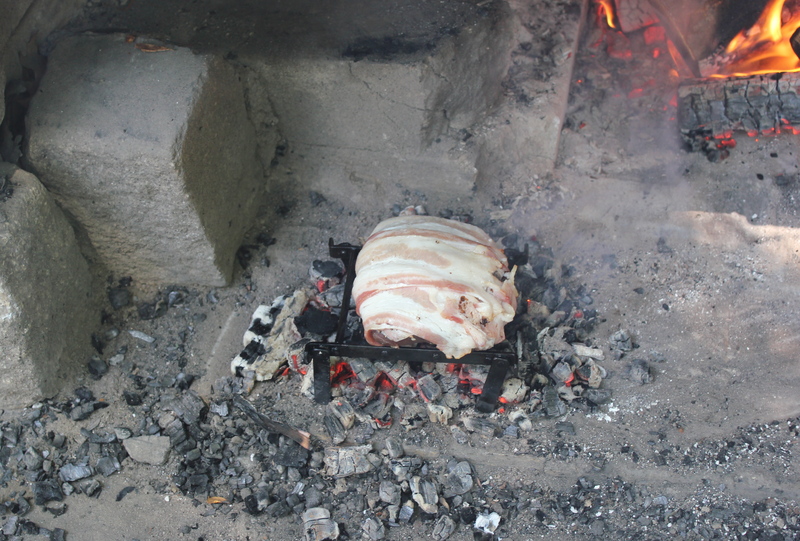 The pie was baked in a pan set inside a Dutch oven with coals piled on top as well as underneath (see above photo, top-left corner). I had a wonderful time in this class. It was really satisfying to use a fire, not just look at it. Very primal, as Sarah described it. Doing hearth cooking also gave me a clearer idea of just how hard colonial women worked. Even so, I loved it — and want to give it another try soon. Adapted from The Old Sturbridge Village Cookbook by Debra Friedman, from a recipe in A New System of Domestic Cookery (1807). 1. Heat butter and milk together until butter is melted; set aside until lukewarm. Beat eggs until light; add sugar and yeast. Slowly add milk mixture, stirring constantly, until incorporated. Stir in 3 cups of flour until just combined. Set in a warm place for an hour or more, or refrigerate overnight. 2. To prepare for cooking, add remaining flour until the dough is no longer sticky. Divide dough in half and shape into two long rolls; cut each into 12 slices. Preheat and grease a griddle or heavy skillet. 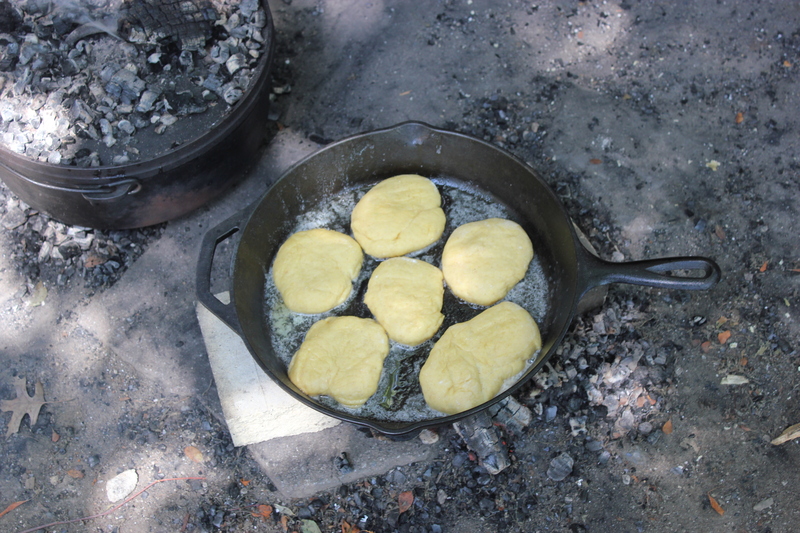 Pat dough slices into a round shape, and then place on cooking surface. Cook until one side is browned, about 7 minutes, then flip and cook on the other side about the same amount of time, until lightly browned. This entry was posted in breads, cooking technique and tagged 18th century cooking, Brooklyn, Dutch oven, food, food history, moose, Old Stone House, open hearth cooking, Rusk, soup meagre by revolutionarypie. Bookmark the permalink. The fact that opportunities to cook like a colonial exist in NYC proves, yet again, that there is something for everyone in this town. What a cool experience… thanks so much for sharing that with us! 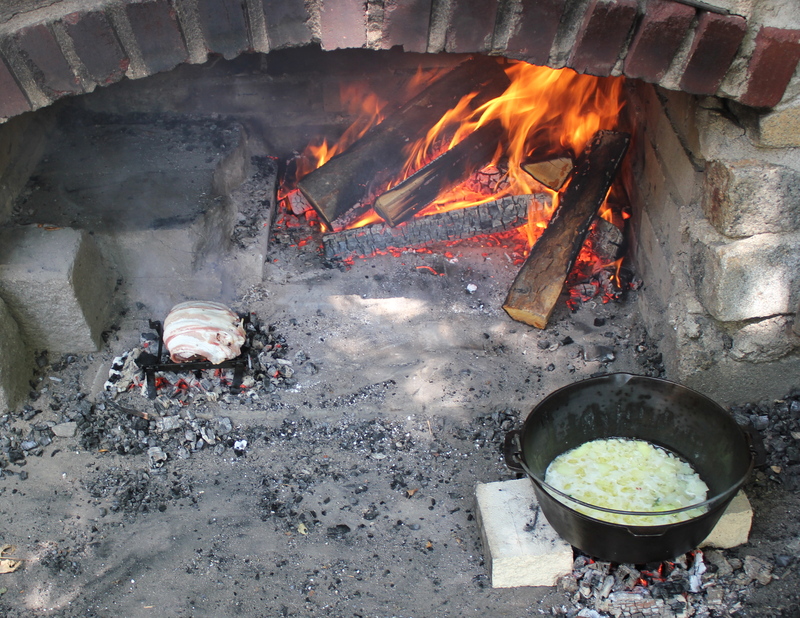 Yes, this city drives me nuts sometimes, but there are endless opportunities, including many you wouldn’t expect (like hearth cooking!). Loved this class! Made me want to see the Dutch-style hearths she described, and reaffirms my suspicion that labor-saving devices in the kitchen and mass-produced food are not a consumer capitalist plot but were originally literal lifesavers for women–how insanely hard and even dangerous it must have been to make food for a family in the 1800s. Ellen, I completely agree with you! We have lost sight of why all those convenience foods became so popular–and I think that people don’t realize exactly how much convenience food we use every day. Pre-ground and sifted flour? pre-washed spinach? cereal? I think it changed women’s lives. Well I never had moose before, so I’m not quite sure. But I think that medium rare to medium would be the way to go, versus extremely well done. FYI, moose is pretty gamey, like venison. But I cooked it so long you really couldn’t tell! Anyway, hope you get to try this sometime. Thanks for visiting! I LOOOOVVVEEE THIS!!!!! EVEN THE “OVER-COOKED” MOOSE! WHAT COULD BE RARER THAN A MOOSE IN NEW YORK CITY??? The whole experience looks and sounds amazing! As an Australian and a cook I am interested in our culinary colonial past which is probably not too dissimilar from the Amercan experience. I love the rusks – and think that cooking once and then eating before drying them out is a more tasty option. 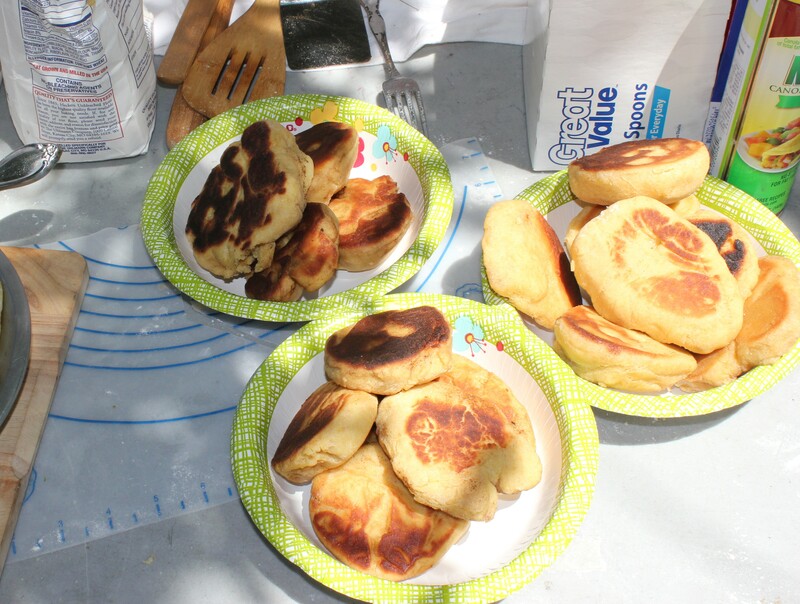 The photos look a lot like home made crumpets, which I have made and posted on my blog. Hi Inga. I looked at your crumpets and they do look very similar, which is surprising given how different the ingredients are. I would love to try making crumpets sometime. I should probably get those rings, though.